My keys on a lanyard long enough to unlock the door without taking it off of my neck. 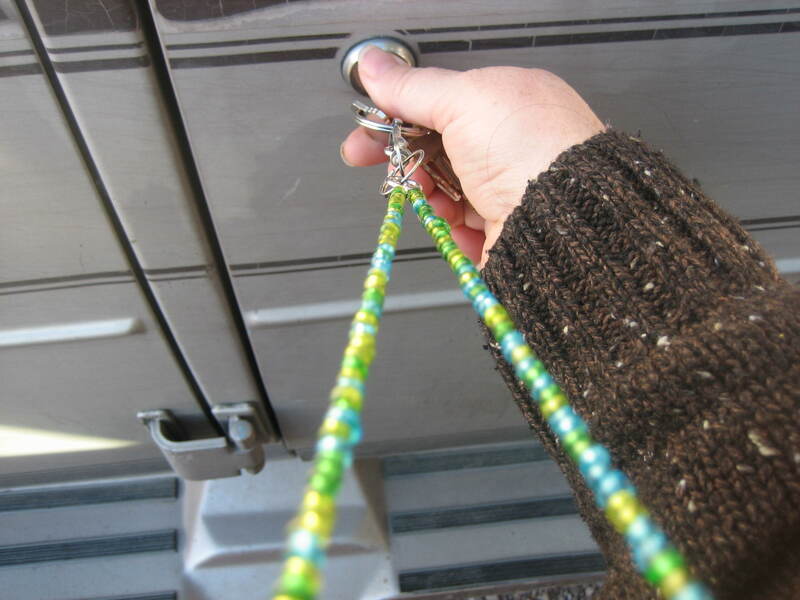 Now my #1 rule of van life if to always know where my keys are. When I’m awake, I wear my keys on a long lanyard around my neck. It’s made from small, pretty blue and green glass beads. I bought it for $1 at a thrift store. I don’t have to take the lanyard from around my neck to unlock the doors, but when I do need to take it off, it lifts right over my head. When I go to bed at night, my keys are within arm’s reach. If I have to drive the van in the middle of the night, I don’t have to fumble in the dark searching for them. Even when I sleep, I know where my keys are. My current pee bucket with lid. gallon ice cream tub with lid. Later I used a plastic one-quart, slightly oval shaped ice cream container with a tight-sealing cover. 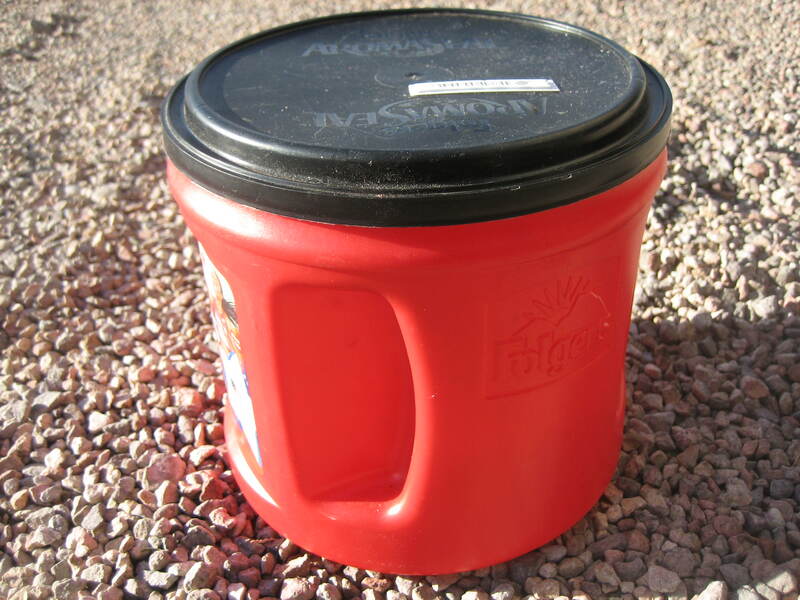 For a while I used a plastic storage container with a snap-on lid with a handle; that container was my favorite, but I lost the lid when I forgot to remove it from the van’s ladder (where it had been propped to air out) before I drove to work. I’m currently using a red coffee can with a snap-off cover. I’ve knocked the pee bucket over before. While it wasn’t the worst elimination disaster I’ve ever had in the van, it wasn’t pleasant. It was so not pleasant. Now when there’s a container of urine in the van, I am very careful not to kick it or bump it or do anything to make it fall over. I certainly don’t want to drive while there’s pee in my bucket. Even with the cover on, the thing can still leak, and I do not want to deal with urine on the rug and on the floor and on the items on the floor. No matter how well you position your side view mirrors, there is going to be a blind spot on either side…there will always be areas that you cannot see. Blind spot mirrors are designed to alleviate this problem. Amazon, auto supply stores, or any store with an automotive department. They are easy to install by peeling away paper backing covering the strong adhesive on the non-mirror side. Press the blind spot mirrors to a clean (cleanliness is crucial for proper sticking) side view mirror and get ready to see everything in your blind spot that you have been missing. Get your oil changed regularly. (The Your Mechanic website recommends every 5,000 to 10,000 miles). Check the air pressure in your tires and add air as needed. Check your fluid (oil, brake, transmission, coolant/antifreeze, power steering) levels and add accordingly. Take care of problems before they become disasters. I have a pair of jumper cables in my van. I believe everyone should carry jumper cables, especially if traveling to areas where it might take a long time/be impossible for roadside assistance to get to you. It’s usually fairly easy to find a helpful person to give your battery a jump start, but helpful people don’t always have jumper cables. In addition to jumper cables, I have a jack and a tire iron. I also typically carry brake fluid, oil, and antifreeze/coolant. 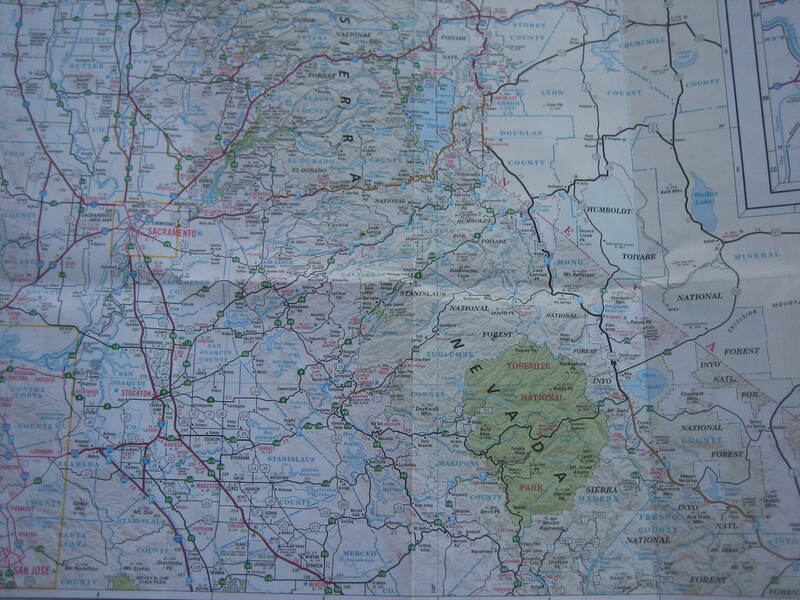 Sure, sure, GPS systems and map apps are great–if they work. I did a Google search on “did people really drive off cliff while following GPS” and came up with a whole list of GPS disaster stories. GPS systems really do lead people astray. I’ve never used GPS, but I do tend to rely on Google Maps. I use Google Maps on my laptop to map out routes in unfamiliar cities, and I use it to decide how to get from a city (or nature area) to my next destination. Several times while traveling in California, Google Maps has directed me to roads that don’t exist or sent me well out of my way. Before I head out to a remote area, I make sure I have everything I need. Even if I can find a store in a small town selling the necessity I’ve forgotten, I’m going to pay more for it in a remote location. These are the essentials I make sure I have before I head out of Babylon: food, water, ice, propane, toilet paper, paper towels, soap, wet wipes, gasoline. I have a trusted friend I text everyday if I have cell service. Before I hit the road, I tell her where I’m going. When I arrive, if I have cell service, I text her to let her know I am safe. If I change my plans, I alert her. If she doesn’t hear from me, she checks in. I know doing this won’t save me if someone decides to hurt me, but I feel more confident knowing someone will realize pretty quickly if I disappear and be able to direct a search party to a starting point. I’ve spent a lot of time picking up plastic drawers and tubs (and their contents) from the floor of the van. Rapid braking and sharp turns made my belongings tumble to the floor. Now I’ve got my stuff tied down with bungee cords. I buy the cheap ones, as they don’t really have to be super strong. They just have to be strong enough to keep my life from flying around as I drive. Having fun is one of the reasons we’re doing this van living stuff, right? We get to travel and see amazing places. We get to explore because we’re not tied down, not spending a huge portion of our money on rent. So don’t get so uptight and worried about what might go wrong that you forget to have fun. In my experience, a bit of prior planning (maintaining the vehicle, strapping down with bungee cords, knowing where my keys are) allows me to relax, arrive safely at my destination, and have a good time while I’m there. I took the photos in this post, except for the one of the blind spot mirror, which is an Amazon link. 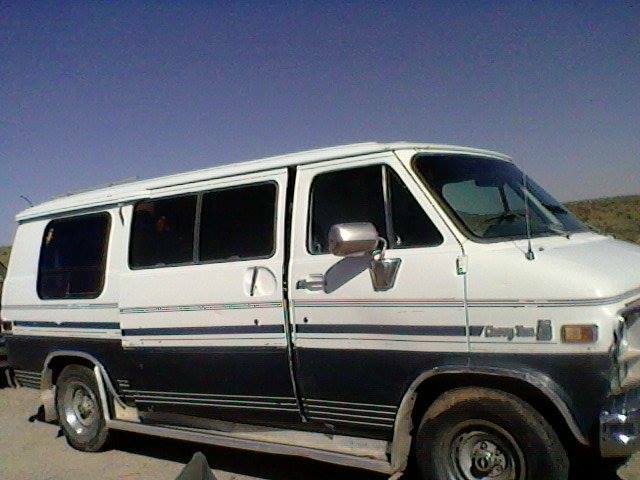 What are your rules of van life/life on the road? Feel free to share them in the comments section below.